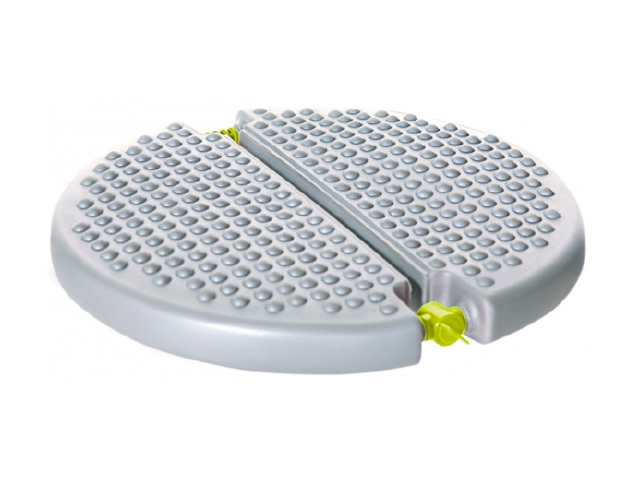 Unique active seat cushion to exercise the stomach, leg, bottom and back while sitting. Make effective use of time when you are sitting down and enjoy a new sense of wellbeing that will be plain for all to see! 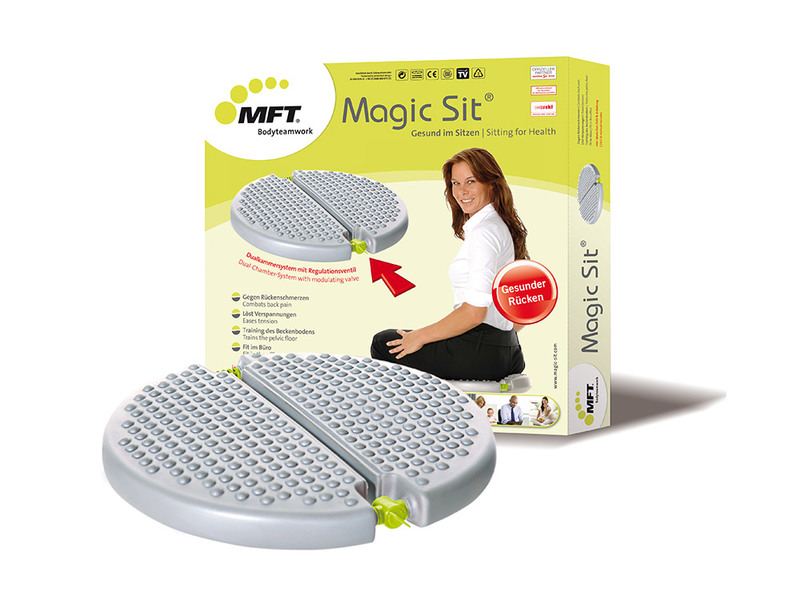 The MFT Magic Sit® active seat cushion is a complete exercise system with everything you need to strengthen your stomach, leg, bottom and back muscles and tauten connective tissues without taking any extra time out of your day. Effective back and pelvic floor training. Use the time when you are sitting to tone your body with amazing effects. The basis for good health, wellbeing and a beautiful body can be found in the active core muscles. Only when muscles are in active use can the required strength be developed to improve your upright posture. Exercising with the Magic Sit stimulates the core muscles which helps you move and hold your posture properly throughout the day. At the same time you will be firming up the tissues and burning fat. How does the MFT Magic Sit work? When you are sitting on the Magic Sit the back, stomach, leg and bottom muscles are stimulated. Through “active” sitting you exercise your muscles, release tension and tone your body. The Magic Sit has a unique dual chamber system with a continuously adjustable valve that you can use to determine the intensity of the exercise. Starting from an easy setting, e.g. to release tension, you increase the training effect by simply turning the valve clockwise, for example if you want to work on your muscles and tone your body. When you close the valve you have a comfortable cushion with massaging effect. Conventional cushions and seating aids often have only a limited effect. Tests show that muscle activity is many times higher with the MFT Magic Sit! Magic Sit is the ultimate in active muscle training and is incredibly simple to use. A further benefit is the two different, comfortable seating surfaces. The training effect of the active muscle exercises is the same with both surfaces. 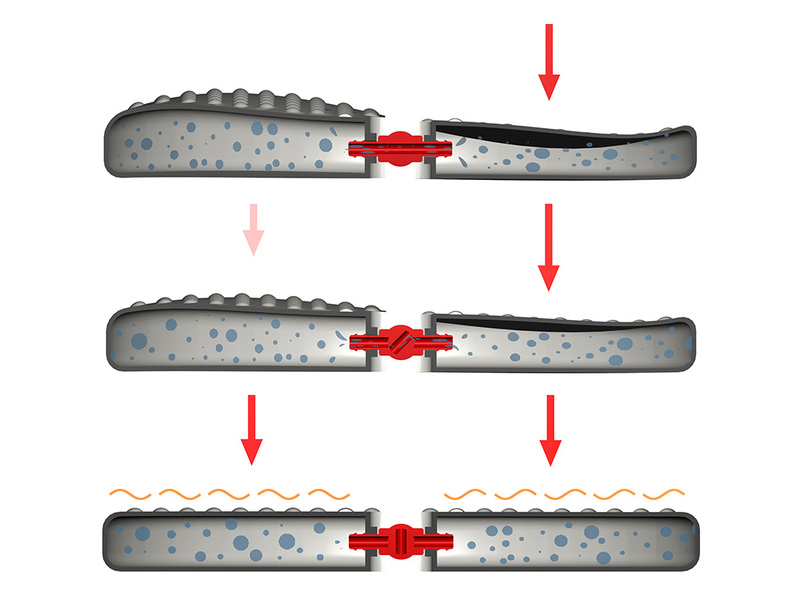 The flat surface may be more comfortable when sitting for long periods. 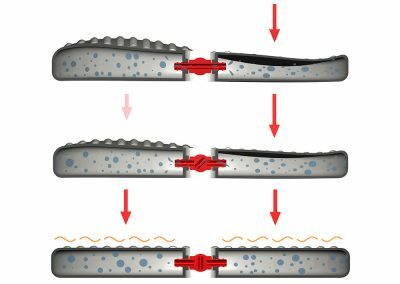 The profiled surface promotes blood circulation and has an additional massaging effect to help counteract cellulite. The distribution of air in the unique dual chamber system means you quickly come to experience a “slumped” body posture as uncomfortable and automatically assume an upright posture – at the same time this is the ideal basis for counteracting back pain and releasing tension. Position the cushion on your seat so that the valve is to the side (therefore, either to the right or left of your thigh). Have your legs slightly apart, keep the soles of your feet on the floor and your hands on your thighs. Now slowly move your pelvis backwards and forwards alternately and pump the air from one chamber to the other, then hold for 5 seconds in the middle. Repeat this exercise 10 x. Position the cushion on your seat so that the valve is at the front (between your thighs). Keep your legs parallel and slightly apart, keep the soles of your feet on the floor and have your hands on your hips to give the best support. Now slowly move your pelvis alternately to the right and left and pump the air from one chamber to the other, then hold for 5 seconds in the middle. You can brace yourself with your hands at the side. Pull your legs up to the side, pump the air from one chamber to the other and hold this position for a moment. Put your feet back on the floor briefly and then repeat the exercise on the other side. You can brace yourself with your hands at the side. Pull your legs up to the side, pump the air from one chamber to the other and at the same time stretch out the outer leg. Repeat this movement on the other side. Keep your legs parallel and slightly apart with your arms stretched out to the side. Move your pelvis backwards and forwards. As you move backwards pull your knees up, as you move forwards stretch out your legs, hold them out for a moment in the middle. Workplace coordination – for a healthy back! To get the best results from the stomach, legs, bottom and pelvic floor exercises and to strengthen your back muscles, we recommend designating around 10 minutes a day specifically to do the exercises. You can sit and do exercises on the Magic Sit for as long as you like. You can set the intensity of the training using the control valve on the Magic Sit and in this way easily adjust it to your personal fitness level. If you have health problems or you are pregnant, please discuss the exercises with your doctor or therapist.